Today begins a new stage in our life, when the objective and subjective factors, and time itself lead us to the need of integration of the Ural-Altai's world. This Ural-Altai world has a great area of various cultures and languages but still we all have a lot of similarities. As a brothers and sisters we share one way of living, one cultural values and almost similar languages. But despite the fact that our Ural-Altai nations have a lot of similarities, we still have obstacles on the way of integration of Ural-Altai world. Turkic language world has one common root but there are three different alphabets, which now uses the Ural-Altai world - Arabic, Latin and Cyrillic. And the problem of segregation, in other words the division of languages, becomes bigger in the Turkic world. From the history, we can see that the Turkic world made a few attempts for integration. I would like to mention well-known historian and publicist Crimean Tatar Ismail Bey Gasprinsky. And we’ve gathered on his homeland today. Thanks to his followers, and also Uyghur PEN who kindly invited us to this conference. GASPRINSKY in the 19th century, tried to create in Crimea Turkic literary language, based on a simplified Turkish. He published the newspaper "Tarzhiman," which was popular among all the Turkic people. The Gasprinsky's idea was brilliant and simple. He expressed it in three words - the unity of the language, spirit and matter. Newspaper preached linguistic and spiritual unification of all Turks. Except of Russia, "Tarzhiman" was read in Turkey, Egypt, Iran, and Eastern Turkestan. The idea of unification of the Turkic world also attracted scientists and educators in more recent times. During the Soviets they were thinkers like Kazakh - Mustafa Shokai , Kirghizs - Kasim Tynystanov, Torokul Aitmatov, Kusein Karasaev. Later, the son of Torokul Aitmatov, a famous Kyrgyz writer Chingiz Aitmatov said with bitterness that separation by the difference of alphabets and the artificial division of the Turkic world moves us away from each other. But the fact remains; the second generation has grown up the people of Central Asia who have lost their languages. In general the mass population of these countries talk in Russian, or some kind of a mix of Russian and native languages. Few books published and translated in our country. And the problem of the languages of national minorities in the Central Asian republics is even worse. A rich literature Karakalpak, Uighur and other ethnic minorities in Kyrgyzstan remains unknown to us. Living side by side with each other, we do not know anything about literature, culture and the history of our brethren. And, in continuing the tradition of integration of the Turkic world, our Central Asian PEN urges to look at the idea of integration is somewhat broader. We propose to go beyond from the region of the Turkic languages to the languages of Ural-Altai region. The majority of Euro-Asian continent is the group of Ural-Altay language speakers. Under the union of Turkic-speaking peoples, we understand the union of the Islamic world. But today the issue is more complicated.But there is a question – is it correct to unite only on the basis of the Islamic religion? In the searching of the ways of necessity to unite not only on the ideas based on Pan-Turkism, but much wider.The people of the Ural-Altai region profess various religions: Islam, Christianity, Buddhism and Tengrianism. Hence, the region's people are making a far greater contribution to global development of culture and civilization. Following this way, we will make richer our life and culture. Therefore, our Central-Asian PEN supports the idea of a general Ural-Altai literary magazine, which will be published in Latin. Of course, we could talk about the revival of the ancient Orhun-Yenisei alphabet. But we must take a sober look at things. Unfortunately, it is currently impossible task. But Latin alphabet can serve as the integration of the Turkic world. Most of the Ural-Altai in the world today uses the Latin alphabet. Translation of texts in Latin for Kyrgyz language, I think would be easier. Until 1941 we used Kasym Tynystanov's Latin alphabet that was perfectly adapted to the Kyrgyz language. I do not propose to change an official alphabet in Kyrgyzstan, knowing that this is due to many political and economic aspects. I only suggest publishing a literary magazine in Latin alphabet. On the pages of this magazine, we can publish the works of writers and poets, educators and linguists of the Ural-Altai in the world. Of course, initially there may be some difficulties, but if the content of our magazine will meet the needs of freethinking people, I think that over time, our magazine will promote the integration of culture of the Ural-Altay region. Also I would like to focus your attention on the idea of creating a new Turkic or Ural-Altai dictionary. This is another of our idea, which I would like to share with you. Previously, there was an ancient Turkic Dictionary by Turkic written monuments of VII - XIII centuries. The dictionary used texts Orkhon-Yenisey script; book Balasaguni Yu, M. Kashgar, an epic Oguz Kagan, Uighur Manichaean texts of books. Dictionary of words consisted of mostly Oghuz and Karluk branch of the Turkic language. But the problem is that the Kipchak branch existed only in the oral form, that’s why it was not included in this dictionary. Oral tradition, of course, complicates the fixation of the language, but that does not mean that it cannot be taken into account. Kipchak heritage - it is epic: "Alpamysh" "Er-Tostik", "Koblandy batyr" and many others that make up the common Türkic priceless heritage. At the time of creation of Turkic dictionary these epics were not transferred to paper. Therefore, there is the need to create a new dictionary with all the Oguz-Kipchak, Karluk branches of the Turkic language. And from these three linguistic branches formed 95% of the Ural-Altaic languages. Such a universal dictionary can be put in the basis for the future in the Turkic language. And the creation of Turkic literary language, I think, would be our strategic long-term goal for the future. This Ural-Altay dictionary, not only would unite into a single cultural space of modern people of the Ural-Altai, but also would open up access to the contemporaries of the literary heritage of the people of this region. 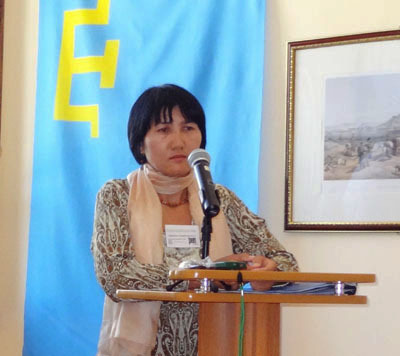 Returning however to our idea of creating Turkic or an Ural-Altai literary magazine. As for Ural-Altay literary magazine, an important aspect in the creation of this magazine is it’s huge circulation. Nowadays we have a lot of Kyrgyz, Kazakh, Uzbek, tatar journals but they all have a very small audience, because separately each country has few readers but together Ural-Altaic region has a huge audience. As we know, all of the modern media, literature, film, television, and computer programs are developed according to market laws and require the mass consumer. For a number of linguistic works with less than a certain "critical mass" in the language is it is doubtful to produce books, films, computer programs and Internet sites. And without this "critical mass" any language forced to use only in everyday life. And for language this means survival and even slow death.Thus, the progress and development of language is impossible without a certain number of populations. Many Turkic nations have number of population even less than this “critical mass”. For example Kyrgyzstan has only 5 million citizens, from which 1 million is abroad, 1 million do not know native language and speak only Russian and the half from the rest number do not read. With the current situation there is a big threat to lose our native language which might be replaced by other more stronger and global language. The biggest language zones are Chinese and English. In the Chinese-language area of over one billion population, and in English about 500 million. Audience of Russian speakers is about 300 million people. And these zones attract authors and publishers. The disappearance of minority languages is a global trend and one common Turkic language will allow us to avoid linguistic assimilation. I share fully the opinion of turkologist Murat Ouali, who says, "Ideally, the adoption of all the Turkic states and regions of the common literary language with a single alphabet, the unified scientific and technical terminology would be an enormous impetus to the progress of science and Turkic culture in general. All the intellectual potential of the Turkic world would have one linguistic field size of about 150 million people." This idea, I would like to propose you as practical action for the future. I agree that this is the big plan and big responsibility and our Central-Asian PEN cannot cope with this alone. So I am sharing here on this esteemed gathering with our idea, and I hope that together we can find ways to implement this idea into reality and make significant steps towards unification and integration of the Turkic and Ural-Altaic world.